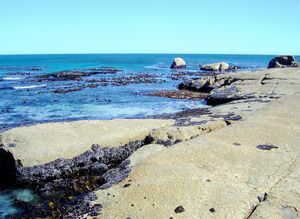 The dive site MV Romelia or Sunset Rocks is an inshore rocky reef with recent wreck in the Llandudno area on the Atlantic seaboard of the Cape Peninsula, near Cape Town in the Western Cape province of South Africa. The line of Sunset Rocks reef seen from the shore. The Romelia lies just to the right of these rocks. The entry point for the Romelia. The narrow gully is a reasonably convenient access route at most states of the tide, and is fairly easily accessible from the road. Sunset Rocks reef is to the left of the photo. North side of Sunset Rocks, Llandudno. The tankers ""MV Romelia" and "MV Antipolis" were under tow by the tug Kiyo Maru no.2 from Greece to scrap merchants in the Far East. On July 28th 1977 during a north westerly gale the tow cable to the Antipolis snagged on the sea bed. In the ensuing confusion the cables broke and the two ships were driven aground by the wind. 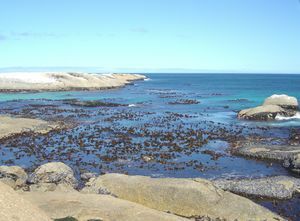 The Antipolis ran aground at Oudekraal, and the Romelia at Sunset Rocks, Llandudno, where its back was broken by the heavy surf and the ship split in two. Later the bow section sank, leaving the stern mostly above sea level on the rocks. Over the years the stern section has also broken up and is no longer visible. The visibility in this area is usually improved after a srong or persistant south easterly wind, which will usually also produce cold water. The visibility is adversely affected by any swell, particularly long period swell, as the surge that this causes picks up the bottom sediment and leaves the water full of particulates which cause the visibility to degrade and lots of backscatter in flash photos. On a good day with flat sea after a south easter, visibility can be more than 20m, but this does not usually last very long. 5 to 10m is more likely, and it can be much worse. Big granite corestone outcrops and boulders. The main line of big surface piercing rocks has lower reef to the north, much of it fairly flat, but with occasional high rocks. It slopes out gradually to about level with the end of the big rocks, then gets deeper fairly fast. 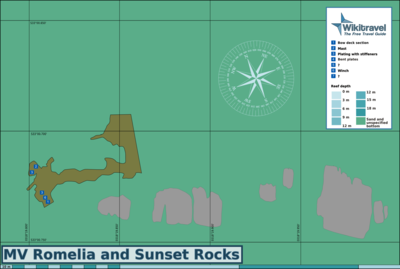 Wreckage is concentrated along the line of the surface piercing rocks on the north side, in relatively shallow water (mostly 6 to 10m), and round the end of the last rock to the west. The wreckage is mostly mangled plate, unrecognisable as to what part of the ship it originated from, with a few odd bits in the deeper area which can be recognised as pipe or catwalk fragments. There is a chunk of bow deck which has inverted over some boulders just beyond the last exposed rock, with big winches and bollards hanging from it, and several metres of large stud link anchor chain wrapped arouns a huge boulder. There is also a section of mast slightly to the north. Best in conditions of limited surge, as the wreck is shallow. Generally this means a low and short period south westerly component of swell. The site is exposed to wind and swell from the south west and north west, but is protected from south easterly wind and waves, so should be dived during or after a period of calm or south easterly wind. The site is usually at it's best in summer but there are also occasional opportunities in autumn and early winter. This is an area which sometimes has upwellings, caused by south easterly winds, resulting in clear cold water rich in nutrients, which after a few days may develop a plankton bloom resulting in poor visibility. Limited roadside parking is available. This site is dived from boats and from the shore. Boat dive: The site is about 11.7km from Hout Bay harbour. Shore dive: Turn off Victoria drive [M6] into Llandudno road. The road makes a sharp bend to the right, but drive straight on into Fisherman’s Bend, and follow the signs for Sandy Bay. These will take you into Sunset Avenue, which goes down to the bottom of the mountainside. Park near to the vacant plot at the bottom of Sunset Avenue, just beyond the first house to the left on the bottom stretch of road. Entry and exit are at a gully directly opposite the vacant plot. There are alternative entries and exits but this one is said to be usable in most weather conditions you would be likely to dive. Shallow rocks have the usual red-bait zone, with lots of sandy anemones and striped anemones. There is a band of Black mussels in the intertidal zone round the rocks. The Kelp is largely Ecklonia in the shallower areas, with Laminaria deeper. 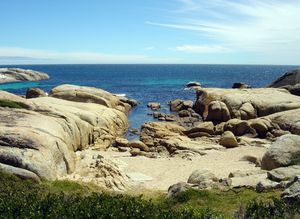 The wreckage is heavily grown with algae on the top, Deeper flat rocks have large groups of urchins and grey cucumbers. In deeper water there are walls and overhangs with more colourful sponge and coral growth, but not as much as some other sites on this coast. Very broken up wreckage of a large oil tanker. There is a section of the bow deck which has inverted and wedged between some large boulders just offshore of the last ecxposed rock. This still has some large mooring winches, bollards and fairleads attached, and is an interesting place to visit. Most of the structure of the vessel is so broken up as to be almost unrecognisable, but there is a substantial section of faired mast near the bow wreckage, which may have been a foremast. If the visibility and lighting is good, there may be opportunities for some fairly spectacular wide angle or fisheye shots, otherwise your best bet is probably macro, but this is not a site with a lot of macro subjects compared to others nearby. You dive here to see the wreck, not the reef. Shore dive:Swim out on the surface to north of the second big rock, Dive a few metres away from the rock and explore the wreckage as you see fit. Boat dive: Drop the shot at the inverted foredeck section, and ecplore this and the wreckage around the pinnacle in a clocwise direction. Return to the foredeck and ascend up the reef if conditions allow, as there is quite a colourful area near the top where you can do a safety stop and enjoy the view while you wait. Cold water, Strong surge in shallow areas. Ragged, sharp edged wreckage. Sea urchins. Strong offshore winds may develop over a short time. A light is useful for looking into the debris, and a compass will help navigate back to shore at the end of the dive, once out of the influence of the huge mass of steel wreckage. This page was last edited on 23 July 2013, at 14:03.